With help from programs designed to assist low-income and battered women, Thompson Falls resident Amanda Childers has been able to build a new life for her and her two sons. Montana Job Services invited Childers to share her success story in Helena last Thursday with state representatives, asking for continued funding of Medicaid’s extension program, HELP-Link. In less than eight minutes, Childers, who stated she was not nervous but excited, told her story. Childers’ determination to make a better life for her family was strong. She walked into the Thompson Falls Job Service hoping to find training in the medical field. “I did not go into the building looking for handouts, I was willing to do whatever I had to,” she emphasized. When she inquired, she felt like she had “won the lottery.” Bonnie Haun, Job Service representative, informed her she qualified for the HELP-Link program. This federally funded program provides financial support and health coverage to low income individuals willing to receive training for future employment. Childers accepted the help, hopped on board and received two certifications; as a certified nursing assistant and phlebotomist. She received straight A’s the entire way and made the Dean’s List. Childers did not stop there. 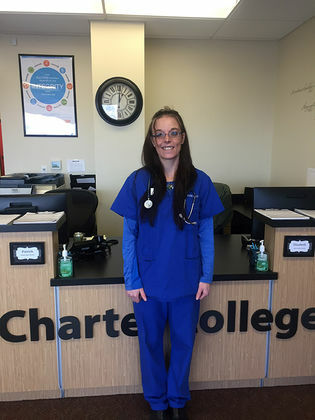 She will be graduating this spring from Missoula’s Charter School as a Certified Medical Assistant. Sanders County Coalition for Families (SCCFF) helped Childers receive continued education funding through the Women’s Independence Scholarship Program (WISP). With this scholarship, created in 1999 to help formerly battered women gain employment training, Childers is able to afford schooling needed to become a career oriented, independent woman; one who will not have to rely on social programs after finding employment. Childers wants people to realize funding for these programs is critical, and not everyone takes advantage of the system. “I did not ask to be abused for 12 years, and end up going through hardships and struggling. I have the opportunity with these programs to work hard, to get where I am no longer a victim,” she said, showing her passion for why these programs are important. In five years Childers sees herself employed, hopefully at St. Patrick’s Hospital in Missoula, and owning her own home, or in a rent-to-own situation. According to Montana health officials, the state’s expanded Medicaid program covers more than 91,500 low-income residents, more than two times what was expected three years ago. Federal funding covers roughly 95 percent of the two-year program, allocating an estimated $1.25 billion to Montana through July 2019. During the 2019 Legislature, Medicaid’s HELP-Link program will be up for renewal, with federal support expected to decline to 90 percent by 2020. Medicaid’s HELP-Link, passed in 2015, was designed to increase employment opportunities for program participants.